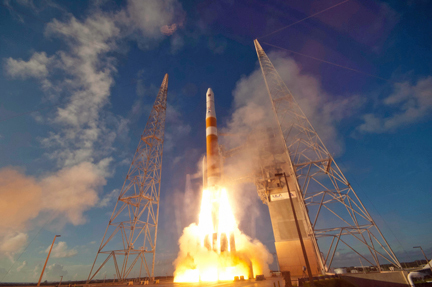 CAPE CANAVERAL AIR FORCE STATION, FL--A United Launch Alliance Delta 4 rocket boosted a Global Positioning System satellite into space Thursday to replace a 19-year-old navigation station that's operated twice as long as expected providing the ultra-precise timing and position data that has become so essential to military and civilian users alike. The 206-foot-tall Delta 4's hydrogen-fueled first stage engine roared to life at 8:10 a.m. EDT (GMT-4), followed five-and-a-half seconds later by ignition of two solid-fuel strap-on boosters, instantly pushing the rocket away from launch complex 37 with 1.2 million pounds of thrust. Climbing through a brilliant morning sky, the rocket's strap-on boosters fell away a minute and 40 seconds after liftoff while the RS-68 first stage engine continued burning at full throttle, gulping propellants as the vehicle accelerated toward space. Three-and-a-half minutes later, the first stage fell away and the Delta's Pratt & Whitney Rocketdyne RL10B-2 second stage engine ignited for the first of three planned firings, boosting the spacecraft into a preliminary orbit. The GPS 2F3 satellite was released into its planned orbital slot three-and-a-half hours after liftoff. United Launch Alliance said in a statement the day after the satellite's release that the Delta 4's RL10B-2 engine suffered "a reduced thrust level" during powered flight. As a result, the engine fired longer than usual to make up for the shortfall. "The onboard inertial guidance and flight control systems compensated for the lower thrust conditions and the Delta second stage delivered the satellite to the proper orbit," ULA said in the statement. "Per standard processes when a flight data item such as this has been identified, ULA and Pratt & Whitney Rocketdyne have formed a robust investigation team with oversight from major customers. The investigation will thoroughly assess all flight and operational data to determine direct and root causes, and identify/implement appropriate corrective action prior to future flights." The satellite, built by Boeing, is the third of 12 planned block 2F spacecraft featuring improved anti-jam technology, more precise atomic clocks, an upgraded civilian channel for commercial aviation and on-board processors that can be reprogrammed in flight. The GPS 2F3 spacecraft will replace GPS 2A-21, which was launched by a Delta 2 rocket in 1993. 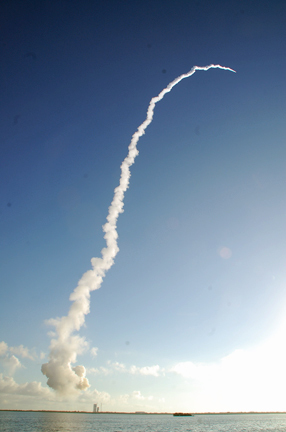 "One of the really great things about our GPS satellites is that they've consistently exceeded their design life," said Col. Steve R. Steiner, chief of the GPS Space Systems Division at the Air Force's Space and Missile Systems Center. "In fact, our oldest GPS 2A that's still operating on-orbit is actually of drinking age. "The steady, measured launching of these GPS 2Fs is in line with making sure we have a steady constellation that is robust and doesn't have any performance hits over time." The Global Positioning System currently is made up of 31 old and new satellites operating in six orbital planes at an altitude of about 11,000 miles. The system was designed so that at any given moment at least four GPS satellites are above the horizon as viewed from any point on the planet, transmitting their exact positions and timing signals from on-board atomic clocks. Small receivers in everything from fighter jets and aircraft carriers to smartphones and car navigation systems use that data to calculate velocity, altitude, latitude, longitude. The positional accuracy of the system is roughly three feet or so, improving to fractions of an inch in some cases. According to Spaceflight Now, the current GPS constellation is made up of 10 block 2A spacecraft built by Boeing, 12 block 2R satellites built by Lockheed Martin, seven modernized 2R spacecraft, also built by Lockheed Martin, and two Boeing-built block 2F satellites. Steiner said the oldest operational GPS satellite is now 21 years old. GPS satellite provide "vital capabilities to our nation's military operations, our global information infrastructure, emergency response, transportation, telecommunications and a host of other commercial applications in every day life," he told reporters at a pre-launch briefing. "Our commitment is to ensure this capability continues to deliver this precise PNT (position, navigation and timing) across the globe." If all goes well, the GPS 2F3 satellite will go into operational service in November.